Contemporary chamber music ensemble Standing Wave released their latest album, New Wave, on Redshift Records this January. The album features School of Music lecturers Christie Reside (flutes) and Vern Griffiths (percussion). The album includes compositions by Michael Oesterle (BMus'92) and was recorded and produced by Will Howie (BMus'04). Redshift Records' brand-new compliation, Redshift XV, features works by Prof. Keith Hamel, alumnus Benton Roark (MMus'07, DMA'13). With performances by School of Music ensemble-in-residence PEP (Piano and Erhu Project) as well as Standing Wave and Saxophilia. Performers include Corey Hamm (piano), Paolo Bortolussi (flute), Christie Reside (flute), Vern Griffiths (percussion), Julia Nolan (soprano sax), and Mark Takeshi MacGregor (DMA'12) (flute). In 2016 Chrystal Records released Double Concertos for Violin and Clarinet, part of their "Making of a Medium" series, which features Prof. Stephen Chatman's 20-minute concerto in four movements for clarinet, violin, and orchestra. One reviewer describes the piece as "a joyous, rhapsodic work that lives up to its putative subject matter." In 2016, the chamber duo Couloir — featuring UBC lecturer Heidi Krutzen (harp) and Ariel Barnes (cello) — teamed up with composers James B. Maxwell and Nico Muhly to release Maxwell Muhly & Couloir, a recording that features "gossamer, glacial sonorities as well as aggressive, pounding rhythmic structures, all bound together over the course of an epic sonic journey." In October Couloir won a Western Canadian Music Award for Classical Music Artist/Ensemble of the Year. In March, Dálava — the award-winning duo of Ph.D. student Julia Ulehla (vocals) and Aram Bajakian (guitar) — released The Book of Transfigurations, a new album of Moravian folk songs channeled through 21st century jazz, world, and post-rock music. The Georgia Straight calls it "astonishing music." 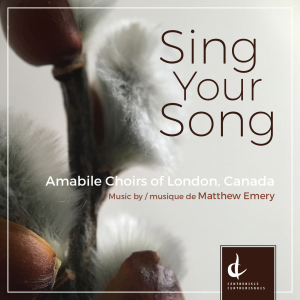 Also in March, composer Matthew Emery (BMus'14) released Sing Your Song, an album of choral works performed by Amabile Choirs of London, Canada and released on the Canadian Music Centre's Centrediscs label. Amabile’s performances and Emery’s writing "question and challenge the human spirit and exemplify why Canadian choral music is renowned around the world."